Kingdom Officers handle the day-to-day business of the Kingdom. Contact information for Branch officers can be found on the branches page. The officers here are categorized by team. Click on a team name to see officers within that team. Click on an officer to see more information about that officer. Each team is responsible for different functions. Master Charles de BourbonThe Arts and Sciences Contingency Deputy administers the office if the Minister of Arts and Sciences, for whatever reason, cannot continue in that role. Lady Ionamyst V. ReginasdottirThe Inlands Arts and Sciences Reporting Deputy is responsible for gathering reports from branch Arts & Sciences Officers in the Inlands Region. Master Francis DarcyThe Rivers and Sciences Reporting Deputy is responsible for gathering reports from branch Arts & Sciences Officers in the Rivers Region. Rowan SpiritWalkerThe Summits Arts and Sciences Reporting Deputy is responsible for gathering reports from branch Arts & Sciences Officers in the Principality of the Summits. Lady ArgoliaThe Tir Righ Arts and Sciences Reporting Deputy is responsible for gathering reports from branch Arts & Sciences Officers in the Principality of Tir Righ. Her Ladyship Katryne MacKimThe Western Arts and Sciences Reporting Deputy is responsible for gathering reports from branch Arts & Sciences Officers in the Western Region. The Arts & Sciences Warrants deputy administers and maintains record of all Arts & Sciences Officer warrants throughout the Kingdom. Masteritsa Marya KargashinaBlack Lion leads the College of Heralds, developing heraldic policies, filling open kingdom heraldic positions, and identifying heraldic needs within the kingdom. Black Lion may work with the King and Queen to serve as the voice of the Crown, serving personally when the Crown desires and providing someone to serve as Sable Mountain when requested. Black Lion reports to the Crown and to the Laurel Sovereign of Arms (top herald of the SCA). Hafr-TókiManages the Herald's Website and the Order of Precedence Website with Dexter Gauntlet. Baroness Elewyn ferch EmrysThe Exchequer is in charge of all things financial and the head of the Financial Committee. That person along with the Seneschal and the rest of the Financial Committee help steer the group down the path of good financial health. The Exchequer is the Treasurer of the group. Mistress Aryanna SilknfyreThe Demi-Lion (Contingency) Herald administers the office if the Black Lion (Principal) Herald, for whatever reason, cannot continue in that role. Magnifico Luciano FoscariThe Kingdom Earl Marshal (KEM) is the chief martial officer of An Tir. Baron Steven DesjardinThe Earl Marshal Contingency Deputy administers the office if the Earl Marshal, for whatever reason, cannot continue in that role. Master Arontius of BygelswadeThe Exchequer Contingency Deputy administers the office if the Exchequer, for whatever reason, cannot continue in that role. Baroness Shawna Kerr of DevonshireThe Exchequer Warrants deputy administers and maintains record of all Exchequer warrants throughout the Kingdom. Lady Rashida bint YusufThe Inlands Archery Deputy is responsible for Archery activities in the Inlands Region. This officer reports to the Royal Archer. Mistress Attia PrimaResponsible for administering the Kingdom's communication system including adding/removing/changing email addresses and providing access to online communication tools used by Kingdom Officers. Duke UlfR Blodfotur Fallgrson This office monitors, configures, updates, secures, and troubleshoots the Servers and Systems we use as a Kingdom. His Lordship Michelino di Gino MartiniThe IT Mailing Lists Deputy is in charge of administering and troubleshooting the Kingdom & branch email lists. Baroness Guðrun SæbjarnarsdottirThis officer maintains contact with Principality and Branch Webministers and helps the Kingdom Webminister ensure that reports are received in a timely manner. Mistress Ysolt Tayler of WindHillResponsible for maintaining and monitoring the Kingdom Helpdesk system. Ensures support tickets are addressed by the Webteam in a timely manner. Master Renart le Fox de BerwykThe Kingdom Archivist attempts to preserve the legacy of the artwork done by the Scribes of An Tir. Master Marco ValentinoThe Kingdom Calendar Contingency Deputy administers the office if the Kingdom Calendar Deputy, for whatever reason, cannot continue in that role. Solbella haTayeretThe Kingdom Calendar Deputy is responsible for maintaining the Kingdom Events Calendar. 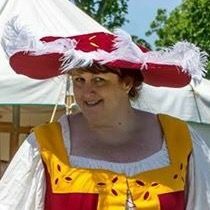 Lady Landinn de MarestThe Chatelaine’s office is responsible for providing an introduction to the Current Middle Ages to new or prospective members; for advising newcomers of the conventions of the Society, their Kingdom and branch; and for encouraging participation in the group. Position vacantThe Chatelaine Contingency Deputy administers the office if the Kingdom Chatelaine, for whatever reason, cannot continue in that role. Tachibana TsukimeThe Chronicler ensures that the Populace is made aware of the news happening within the Kingdom and within the SCA that may affect various aspects of their play. Position vacantThe Chronicler Contingency Deputy administers the office if the Chronicler, for whatever reason, cannot continue in that role. Baroness Alessandra de MontefeltroThis Officer ensures that Officer and Branch contact information is up to date in the Kingdom Newsletter. This officer works closely with the Kingdom Webteam to ensure the Kingdom Website is also up to date. Position vacantThe Events Contingency Deputy administers the office if the Kingdom Events officer, for whatever reason, cannot continue in that role. The Honorable Lady Margaret FaeThis office is also known as the Sable Sable Herald. Masteritsa Rannveig ~skrifari (aka Bronwen Elgars)The Kingdom Scribe Contingency Deputy administers the office if the Kingdom Scribe, for whatever reason, cannot continue in that role. Mistress Alianora GreymoorThe Kingdom Seneschal is responsible for the administrative operation of the Kingdom of An Tir and is the sole corporate officer in the Kingdom. The modern world recognizes Kingdom Seneschals as Regional Vice Presidents. The Kingdom Seneschal maintains and updates Kingdom Law as well as the kingdom’s business records. Viscountess Lenora TrubleThe Kingdom Seneschal Contingency Deputy administers the office if the Kingdom Seneschal, for whatever reason, cannot continue in that role. Viscount Seamus O'CaellaighThe Social Media Deputy is responsible for coordinating the Kingdom-level efforts on outbound social media presences. Her Ladyship Alicia du BoisThe Kingdom Webminister is responsible for the maintenance and upkeep of the Kingdom Website, the Kingdom’s official communications systems (officer email, mailing lists), and to ensure that all branch websites remain in compliance with Society standards. Duke UlfR Blodfotur FallgrsonThe Kingdom Webminister Contingency Deputy administers the office if the Kingdom Webminister, for whatever reason, cannot continue in that role. Mistress Isabella LucreziaServes as the primary contact for the Laurel’s Council in An Tir. Elizabeth Turner de CarlisleThe Lions Blood Herald leads the Submissions department. Praefectus Regulus AugustusServes as the primary contact for the Council of the Masters of Defense in An Tir. Laerdimodir Sigridis Gala EiriksdottirThe Minister of Arts and Sciences is the chief artistic and scientific officer to the Crown and Kingdom. They are responsible for encouraging the research and development of historically accurate arts & sciences, including research papers, across the Kingdom by aiding individuals or branches in networking with other individuals or branches and by encouraging arts & sciences events at the Kingdom, Principality, regional, or branch level. Sir Andras TruemarkServes as the primary contact for the Order of the Grey Goose Shaft in An Tir. Her Ladyship Laurin of RosewoodThis Officer maintains an archive of Charters from past reigns in case a replacement is needed. Mistress Genevieve Marie Etiennette de MontagneServes as the primary contact for the Pelican’s Council in An Tir. Master Oddr ÞiálfasonThe Queue Forchée (Contingency) Herald administers the office if the Black Lion (Principal) Herald, and Demi-Lion Herald for whatever reason, cannot continue in that role. His Lordship Arthur of the Green Arrow, OGGSThe Royal Archer is the head of Archery activities in the Kingdom. This officer reports to the Kingdom Earl Marshal. Currently VacantThe Royal Archer Contigency Deputy assumes responsibility for the office of Royal Archer in the event that the Royal Archer cannot complete the term. Currently VacantThe Sable Mountain Herald is appointed by Their Majesties as the principal Royal Court Herald for Their reign. Baronessa Chiara Francesca Arianna d'OnofrioMaintains the content of the Kingdom College of Scribes website. Position vacantThe Seneschal Warrants deputy administers and maintains record of all Seneschal warrants throughout the Kingdom. Fina MacGrioghairThe Silver Rose Herald is responsible for gathering reports from branch Heralds in the Inlands Region. Mistress Sionann in Ui FhlaithbheartaigPrincipality Scribe for the Principality of Tir Righ. The Honorable Lord Rafe NeutonResponsible for the Principality of the Summits Website. Maintains contact with Principality branches and communicates with the Kingdom Webminister regarding any IT-related issues happening in the Principality. Provides a quarterly report to the Kingdom Webminister regarding the IT status of all Principality Branches. Duke UlfR Blodfotur FallgrsonResponsible for the Principality of Tir Righ Website and tirrigh.org infrastructure. Maintains contact with Principality branches and communicates with the Kingdom Webminister regarding any IT-related issues happening in the Principality. Provides a quarterly report to the Kingdom Webminister regarding the IT status of all Principality Branches. Bledyn Drwg de CaerdyddThis officer coordinates activities for youth and families at events and throughout the year. Taliesin ap HafganThe Youth and Family Activities Contingency Deputy administers the office if the Youth and Family Activities Deputy, for whatever reason, cannot continue in that role.